By Roch Thornton, CAP 2-7-2, 1970-71I always enjoyed watching the Bob Hope Christmas Special on television, even before I became a member of the audience. Once a year through the late ’60s, my family would gather to watch snippets of Bob’s USO shows filmed at various U.S. bases around the world. Some of the music and acts in Bob’s show were hokey, but the jokes were great. And half the fun came when the camera panned across the servicemen and women in the crowd. They smiled, laughed and cheered like they were having the time of their lives. They were. Those of you who remember black and white TV probably know what I mean. I ran out of film after taking only two photos at Bob Hope’s Christmas USO show in Da Nang. 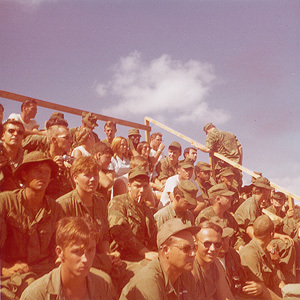 Both shots were of the audience, and I’ll bet I took this one because there were three American girls in it — USO or Red Cross volunteers, or maybe Army nurses. There was a powerful element of patriotism to those TV specials. And every year there was a scene or two guaranteed to choke you with emotion. I remember a shot of Bob’s troupe visiting a field hospital somewhere and the camera showed a beautiful actress sitting next to some poor guy who was bandaged from head to foot, just holding his hand, smiling and talking. And they always seemed to get a shot of a young-looking soldier wiping tears during the singing of ‘Silent Night.’Well, Christmas finally came to Thanh Quit. My Mom sent us a 2-foot-tall artificial Christmas tree that we cheerfully lugged around for three weeks, setting it up and redecorating it every day. The mail brought Christmas cards and candy from friends and family, strangers and schoolkids back in the World. And word came down that 7th Co. had some tickets for the Bob Hope show in Da Nang. Each CAP got one ticket to the show, and each CAP decided who to send. In CAP 2-7-2 we drew straws and I pulled a long straw with the other second place winners. I was disappointed for two reasons. First was the Bob Hope Christmas Special. After watching it for years, I wanted to be in it — at least in the audience. Second was the fact that my father, Aircraft Ordnanceman 2 Joe Thornton, had been in the audience for a Bob Hope USO show on a South Pacific island in 1944. I figured attendance was a family tradition. The ticket winner in CAP 2 was a new guy who had only been with us for a couple of weeks. I don’t know what moved him, but shortly after we drew straws he announced that he wanted me to have the ticket because I was the old-timer of CAP 2-7-2. My memory is unclear on this point, but I think the new guy was Steve Maynor. I was surprised at the offer, but I accepted with very little persuasion. A day later I was on a six-by full of noisy Marines headed for Da Nang. On arrival at the outdoor theater at Freedom Hill, we scrambled into the bleachers looking for seats. The seats down front were reserved for VIPs or already occupied, but I managed to find a spot off to one side barely 30 yards from the stage. Then we waited. And waited. We probably waited only two or three hours for the show, but it seemed like a lot longer. It got pretty hot sitting in the bleachers in the sun. Personally, I was thankful it wasn’t raining. Believing I had a 24-frame roll of film, I used my borrowed camera to take a couple of pictures of the crowd. Oops! It was only a 12-frame roll and I was out of film before the show even began. I don’t actually remember much about the show. Besides Bob Hope, the acts included Gloria Loring, Lola Falana and the Golddiggers, an all-girl dance troupe that reminded me of the Rockettes. I probably remember the first two because their names roll smoothly off the tongue. Funny, I don’t remember any men being in the show even though Bob always brought a famous athlete on his Christmas USO tours. It may have been Cincinnati Reds catcher and major league MVP Johnny Bench on the 1970 tour, but again I’m not sure. By 1970, the Vietnam War was thoroughly unpopular in America. I imagine it was harder than usual for Bob to recruit talent for his USO tour. The performers we saw in Da Nang were superbly talented and gave a great show, but I’d never heard of any of them. I’ve heard of them occasionally in the years since and always wished them well because they sacrificed their Christmas for us in 1970. Buh-duh-BOOM! The crowd roared. I mean really. We were falling over laughing! You had to be there. After so many years and shows, Bob Hope had really mastered the art of playing to a young, military audience. His timing was perfect, even allowing for the huge crowd, the outdoor setting and the echoing public address system. And we were not a critical audience. That crowd would probably have laughed at Bob Hope reading the phone book. The show ended and we applauded and cheered like crazy. We even cheered Les Brown and his Band of Renown. Back home in CAP 2-7-2, I told and re-told the story of my trip to the Bob Hope show many times, complete with jokes and descriptions of the girls. It was a long time before my buddies got tired of hearing that story.